I took my toddler to the park the other day and of course, out of all the kids on the playground, my daughter decided that she wanted to play with the one that kept coughing in her face. Despite my best efforts to distract her and lead her to other areas of the playground, she insisted on hovering around the germ-spreading child. Which is why I’m not the least bit surprised that she has now come down with a cold herself. I have been using all of my natural home remedies to help her feel better, so I thought I would share them since cold and flu season is upon us. Over the counter cold and flu medications don’t “cure” you, they simply alleviate your symptoms. 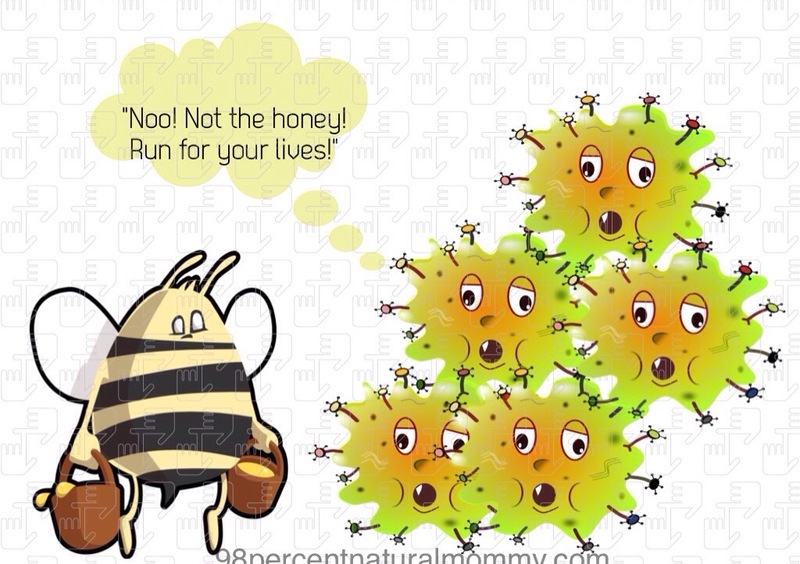 The only “cure” for a common cold or flu is your own immune system. 1. Get lots of rest. The less activity you do, the more energy your body can allocate to fighting off viruses and bacteria. 2. Eat foods high in Zinc. Zinc has been proven to boost your immune system7. I have been giving my daughter a small bowl of pumpkin seeds every day. Other foods that are high in zinc are lamb, beef, sesame seeds, lentils, garbanzo beans, cashews, quinoa, turkey and shrimp10. 3. Steam. For adults, leaning over a pot of boiling water and taking deep breaths is a quick way of loosening up congestion. This method is obviously not practical with young children. A more baby or kid-friendly option is to sit with your child in the bathroom, with the shower running on the hottest water setting (make sure the door is closed and the fan is turned off). Although this method is not very environmentally-friendly, it will turn your bathroom into a steam room which helps loosen up any nasal or chest congestion. A less wasteful option is to use a humidifier in your child’s room as he or she sleeps. It loosens up their congestion which helps them breathe better which in turn helps them sleep better. 4. Carrot-apple-ginger juice. If you have a juicer, extract the juice of 4-5 carrots, 2 apples, and a 1-inch piece of ginger. 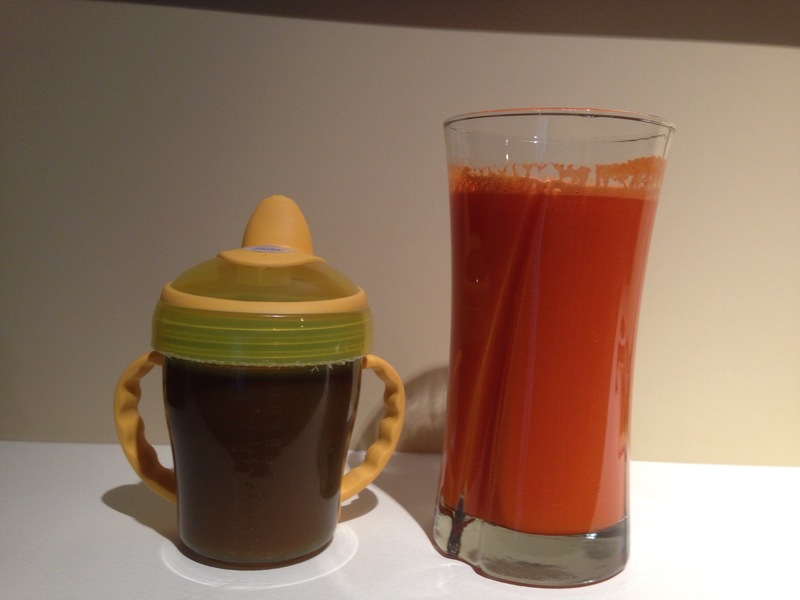 The apples and carrots make this juice sweet so it’s more appealing to kids, and both the beta carotene in the carrots as well as the anti-microbial properties of ginger give this kid-friendly drink a good immune system boost6,8. 6. Herbal water (basically Indian herbal tea without the tea bags). Boil half a teaspoon each of fennel and celery seeds along with 2 cardamom, 3 cloves and 2 sticks of cinnamon bark in 2 cups of water until the water is reduced in half. Wait until it cools, then add a teaspoon of buckwheat honey and drink it. This is my mother’s herbal remedy and I give my 2 year old about 3/4 of a cup 2x a day when she is sick. Fennel seeds, cloves, celery seeds and buckwheat honey have antimicrobial properties1,3,9,11 and cinnamon and cardamom enhance immune system functioning2,5. You can also throw a 1/2-inch piece of ginger root into the pot for an added immune boost. Ever since I started using this remedy, my daughter’s colds have decreased in duration and severity. The trick is to keep taking it until the cold is completely gone, not just until you start feeling a bit better; otherwise the symptoms will just get worse again. I drink it myself when my daughter is sick and it prevents me from getting sick as well (anyone with a snotty-nosed, sneezing, coughing yet affectionate toddler knows that it’s almost impossible to not get sick yourself when your kid is sick). And don’t to forget to wash both your hands and your kids’ hands before you eat, as well as whenever you leave a public place. Prevention is always easier than treatment! The advice in this post is not intended to replace the advice of a medical practitioner. Visit your doctor if you or or child are sick and your symptoms are severe or last more than a few days. 1. Al Akeel R, Al-Sheikh Y, Mateen A, Syed R, Janardhan K, Gupta VC. Evaluation of Antibacterial Activity of crude protein extracts from seeds of six different medical plants against standard bacterial strains. Saudi J Biol Sci. 2014 Apr;21(2):147-51. doi: 10.1016/j.sjbs.2013.09.003. Epub 2013 Oct 5. 2. Bhat J, Damle A, Vaishnav PP, Albers R, Joshi M, Banerjee G. In vivo enhancement of natural killer cell activity through tea fortified with Ayurvedic herbs. Phytother Res. 2010 Jan;24(1):129-35. doi: 10.1002/ptr.2889. 3. Cortes-Rojas DF, de Souza CR, Oliveira WP. Clove (syzygium aromaticum): a precious spice. Asian Pac J Trop Biomed. 2014 Feb;4(2):90-6. doi: 10.1016/S2221-1691(14)60215-X. 4. Karimi MH, Ebadi P, Amirghofran Z. Parsley and Immunomodulation. Expert Rev Clin Immunol. 2012 May;8(4):295-7. doi: 10.1586/eci.12.12. 5. Lee BJ, Kim YJ, Cho DH, Sohn NW, Kang H. Immunoregulatory effect of water extract of cinnamon on anti-CD3-induced cytokine responses and p38, JNK, ERK 1/2, and STAT4 activation. Immunopharmacol Immunotoxicol. 2011 Dec;33(4):714-22. doi: 10.3109/08923973.2011.564185. Epub 2011 Mar 29. 6. Lo HM, Wang SW, Chen CL, Wu PH, Wu WB. Effects of all trans retinoic, retinol, and beta-carotene on murine macrophage activity. Food Funct. 2014 Jan;5(1):140-8. doi: 10.1039/c3fo60309a. 8. Sultan MT, Buttxs MS, Quayyum MM, Suleria HA. Immunity: plants as effective mediators. Journal Crit Rev Food Sci Nutr. 2014;54(10):1298-308. doi: 10.1080/10408398.2011.633249. 9. van den Berg AJ, van den Worm E, van Ufford HC, Halkes SB, Hoekstra MJ, Beukelman CJ. An in vitro examination of the antioxidant and anti-inflammatory properties of buckwheat honey. J Wound Care. 2008 Apr;17(4):172-4, 176-8. 10. Whfoods.com, (2014). zinc. [online] Available at: http://www.whfoods.com/genpage.php?tname=nutrient&dbid=115 [Accessed 4 Oct. 2014]. 11. Zhou Y, Taylor B, Smith TJ, Liu ZP, Clench M, Davies NW, Rainsford KD. A novel compound from celery seed with a bactericidal effect against Helicobacter pylori. J Pharm Pharmacol. 2009 Aug;61(8):1067-77. doi: 10.1211/jpp/61.08.0011.